White Caps Estate sits on historic and beloved Marshall Point Road in Port Clyde – this family compound overlooks both Muscongus and Penobscot Bay and provides stunning views of the islands, like Monhegan, that dot the horizon. Cherished by family for years, White Caps is now available on the rental market. If you think about a vacation in the Midcoast, think about this property. Walk to the Marshall Point lighthouse (this is where Tom Hanks, when he was playing Forrest Gump ended his East Coast run) or to sandy Drift Inn Beach or stroll into town for dinner at the end of a long day. 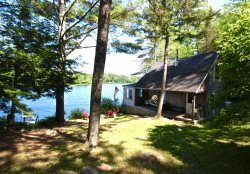 This is a classic Maine family summer house – lovingly maintained by a dedicated caretaker – the house feels just right...clean, comfortable, functional and charming. A large yard, outdoor living spaces, a main house complimented by a rustic bunk house, and a recently renovated guest cottage complete the feel of Maine vacation.. The main house has stunning view of the ocean from both inside the property and from the two exterior decks. The first floor has a large kitchen, dining room, living room and a sort of observation room at the front of the house where you can watch waves crash, lobster boats haul traps, sail boats glide by. This room allows you to appreciate the view in any weather – it is fully furnished and heated. Upstairs are three bedrooms – the master has a queen bed and a views of the ocean. The second bedroom is at the back of the house with a queen bed and a pass through to a third bedroom with two twins. There is 1 full bath (recently renovated tub and shower combo and) and a half bath. The bunk house is located between the main house and the guest house – this is a sweet, rustic little building with a set of bunkbeds. The guest house, which is above the detached workshop, has some of the best views of the ocean thanks to the large front deck. Also recently renovated, the guest house has a kitchen, full bathroom, living room and two bedrooms: the master has a queen and the second bedroom has 2 twins. Each residence has a flat screen television with cable reception and wifi. All linens and towels are provided. Both the Main and the Guest Houses are equipped with fully functioning kitchens, heat, grills, television and WiFi.